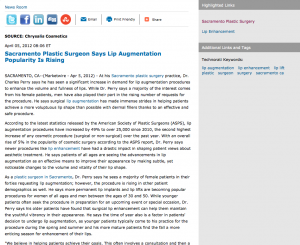 Sacramento, CA — At his Sacramento plastic surgery practice, Dr. Charles Perry says he has seen a significant increase in demand for lip augmentation procedures to enhance the volume and fullness of lips. While Dr. Perry says a majority of the interest comes from his female patients, men have also played their part in the rising number of requests for the procedure. He says surgical lip augmentation has made immense strides in helping patients achieve a more voluptuous lip shape than possible with dermal fillers thanks to an effective and safe procedure. According to the latest statistics released by the American Society of Plastic Surgeons (ASPS), lip augmentation procedures have increased by 49% to over 25,000 since 2010, the second highest increase of any cosmetic procedure (surgical or non-surgical) over the past year. With an overall rise of 5% in the popularity of cosmetic surgery according to the ASPS report, Dr. Perry says newer procedures like lip enhancement have had a drastic impact in shaping patient views about aesthetic treatment. He says patients of all ages are seeing the advancements in lip augmentation as an effective means to improve their appearance by making subtle, yet noticeable changes to the volume and vitality of their lip shape. As a plastic surgeon in Sacramento, Dr. Perry says he sees a majority of female patients in their forties requesting lip augmentation; however, the procedure is rising in other patient demographics as well. He says more permanent lip implants and lip lifts are becoming popular procedures for women of all ages and men between the ages of 30 and 50. While younger patients often seek the procedure in preparation for an upcoming event or special occasion, Dr. Perry says his older patients have found that surgical lip enhancement can help them maintain the youthful vibrancy in their appearance. He says the time of year also is a factor in patients’ decision to undergo lip augmentation, as younger patients typically come to his practice for the procedure during the spring and summer and his more mature patients find the fall a more enticing season for enhancement of their lips. “We believe in helping patients achieve their goals. This often involves a consultation and then a discussion of the different options and products for most. However, for seasoned patients, the process is often abbreviated as they will know just what it is they need in order for them to look their best, and we simply follow their lead,” says Dr. Perry. Regardless of age or reason for undergoing a cosmetic procedure, Dr. Perry says consulting with a board-certified and experienced plastic surgeon is essential for achieving the proper results. He stresses the need for choosing a practice who is dedicated to personalized care, particularly with lip augmentation, as the procedure requires special intricacy and precision because of the position of the lips as a central focal point on the face. Dr. Perry says partnering with a passionate and qualified surgeon means patients can achieve a fuller volume to their lips and a more confident outlook on life. Dr. Charles Perry received his undergraduate education at the University of Puget Sound and his medical degree from the University of Washington in Seattle, after which he completed a general surgery internship at Maricopa County Medical Center, a general surgery residency at the University of Arizona, and a plastic surgery residency at the University of Massachusetts. He is board-certified by the American Board of Plastic Surgery, a Diplomat of the American Board of Surgery, a Fellow of the American College of Surgeons, and a member of the American Society of Plastic Surgeons. Dr. Perry has volunteered in Ecuador, performing cleft lip and palate reconstructions, as well as with the Plastic Surgery Educational Foundation and the Medical Outreach Program at X’axlip Indian Reservation. Located at 3800 J Street Suite 210 in Sacramento, CA, Dr. Perry’s practice, Chrysalis Cosmetics, can be reached at (916) 248-4447. He can also be contacted online via the websites sacramentoplastics.com or the Chrysalis Cosmetics Facebook page.